Russia has had an active foreign policy of late. Much of it seems directed at countering the U.S.
From vetoing every UN Security Council resolution against Syria to signing major military deals, Russia—and especially its President Vladimir Putin—has been all over the news of late. With its global political activism, Moscow appears to be going all out to take on the United States. Putin seems to be more focused on foreign policy during this, his third stint as Russian president. This focus is evident from the recent deals, developments and statements emanating from the Kremlin. Take, for example, the billion dollar military aid package Russia is providing to Kyrgyzstan. This support came after that country’s parliament voted to force U.S. forces out of the country by closing down the Manas Transit Center (MTC) before July next year. Although in 2009 the Kyrgyz authorities managed to increase the MTC's rent from $17.4 million to $60 million, this time around, things seemed different. Putin made sure that President Almazbek Atambayev wouldn’t be lured by financial gains, offering inducements such as a debt waiver, along with deals that included purchasing Kyrgyz assets and constructing dams in the country. With Atambayev in charge, MTC's closure, and a 15-year renewal of the lease for the Russian military base in Kant, Moscow would appear to have locked in an important regional ally. Tajikistan was another beneficiary of Russian generosity and military support in Central Asia, as the recipient of an arms deal worth $200 million. Following this development, Tajik President Emomalii Rahmon, during a visit to Russia earlier this month, also promised to ratify a long-delayed deal concerning a Russian military base in his country. In fact, Russia has been active from the Caucasus to the Middle East. 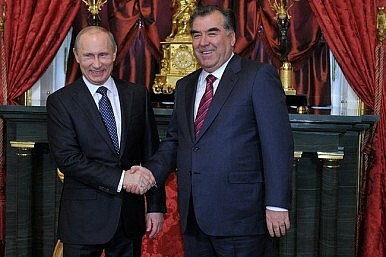 Moscow recently signed a $4 billion military deal with Azerbaijan, a rival of close Russian ally Armenia. The deal was done during Putin's first visit to Azerbaijan in seven years, and clearly indicates Putin’s desire to consolidate Moscow's regional influence. Armenia has voiced grave concerns over the deal, as it is directly relates to the long standing Nagorno-Karabakh conflict it has with Azerbaijan. Other Russian efforts in Central Asia and Caucasus could be seen in the context of the Collective Security Treaty Organization, a Central Asian military alliance and a long-term project for Moscow. In the turbulent Middle East, meanwhile, Russia has thwarted a UN Security Council resolution on Syria and rejected accusations that the Assad regime has used chemical weapons. It has also recently announced the shipment of advanced air defense missiles to Syria. Iran has also benefited from Moscow's support. Amidst a Western consensus on the threat of Iran's nuclear ambitions, Russia has come forward to support Tehran and defend its case internationally. And, of course, Russia recently granted asylum to NSA whistleblower Edward Snowden, which prompted U.S. President Barack Obama to cancel a one-on-one with Putin at the G20 Summit in St. Petersburg. Obama also accused Moscow of slipping back into a Cold War mentality. Time will tell if that assessment is accurate, but for now, the flurry of international deals and activity do suggest something similar to Soviet-era empire building.